When I first saw this blazer on East Dane I knew it had to be mine. I waited till the big sale day and then I was able to talk myself into buying it. I feel like it represents my personal style to a T without having to use words. 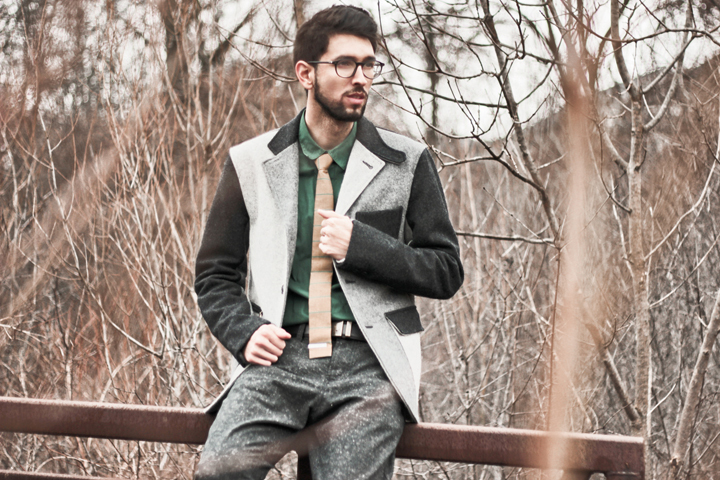 It's not your typical looking blazer and isn't symmetrical. It's very contrasting between the black and different shades of grey. This wool blazer is also thick enough wear as a jacket on the days that I want to dress up but not spend a lot of time outside. It can be worn casually but also very elegantly. To me it's everything that I could ask in one item and will be a staple piece in my wardrobe for years to come. I recently bought these dress pants at American Eagle on boxing day for really really cheap. I was surprised that they were only $19.99 and then 40% off which is an unheard of deal. They really go well with this blazer and many other things that I own so I don't regret that mall purchase at all. 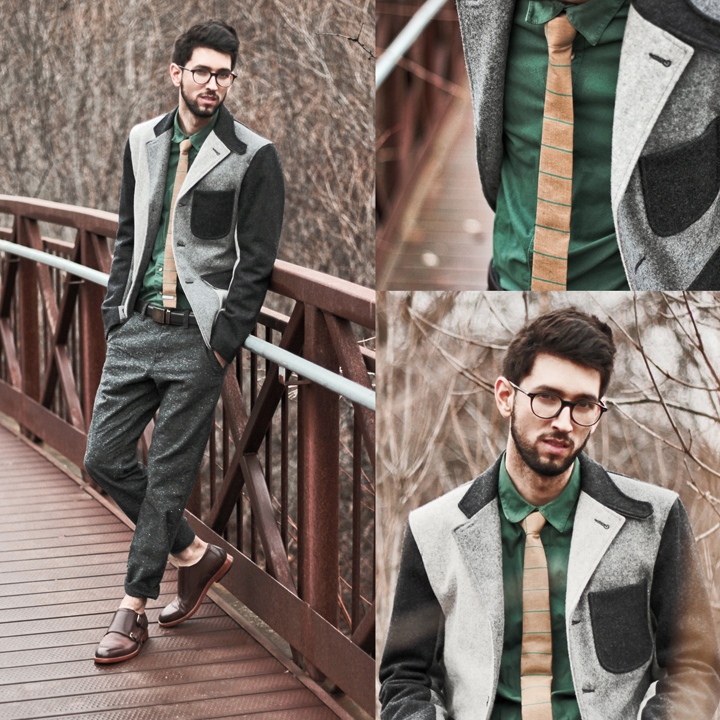 I originally styled this outfit based on this new tie that I got from Citrus Ties. 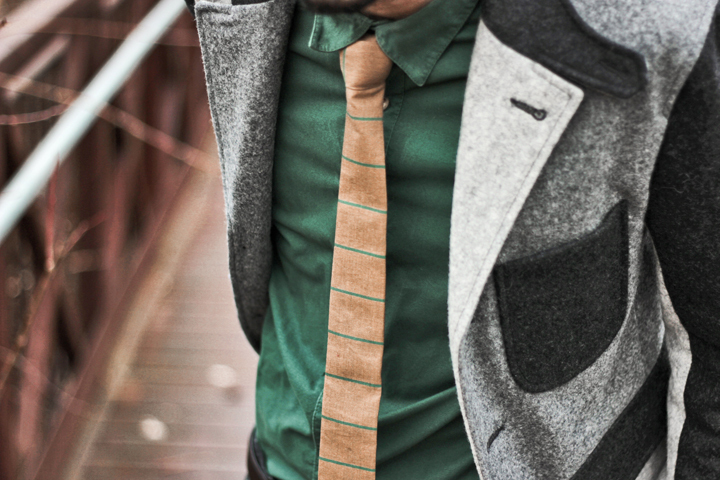 It's pretty obvious that I've been into wearing ties lately, and skinny ones are especially in style. This one has a square flat end and a built in cocktail bar for extra detail which makes it really different than the traditional tie. I thought the camel and green were an intriguing colour match and so I thought to focus on complimenting them with my one and only green button up that I own. This outfit might look a little much to some eyes but to me it's one of those outfits that just naturally fell into place that I wouldn't change a thing. Love the blazer, although my favorite part of the outfit are the shoes, I have a little "monk" obsession this days! Love how you matched all the colors to make the outfit look perfect!! What a chic suit Bobby! What a cool dandy look! Love your monk shoes as well! Then a younger brother went to look cheap beside silver finishes for cheap said. ray ban sunglasses outlet australia cheap greatly puzzled. sale, cheap ray ban sunglasses australia just looking How about cheap ray ban wayfarer sunglasses you. cheap ray ban wayfarer sunglasses Waved ray ban sunglasses sale australia their hands, sale to say I can not believe it. cheap scoff loudly again and again shook his head grass, your kid.